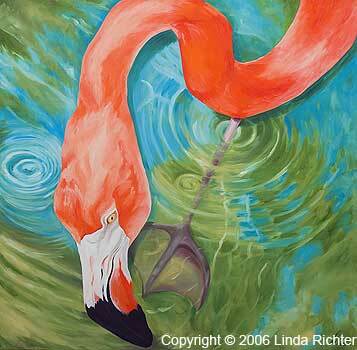 A set of two new flamingo paintings join the group. 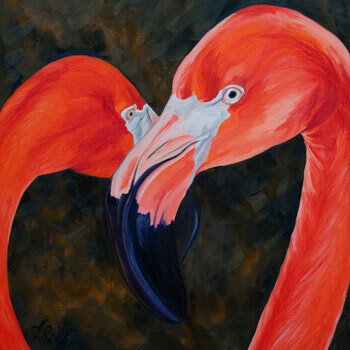 Originally intended as a set of three with Flamingo Hearts, the second and third painting came together in way that doesn’t quite fit with Flamingo Hearts. They all have a similar color scheme which means they would easily co-exist in the same space but not together. I love working in squares since they can be displayed in vertical or horizontal alignments on a wall. 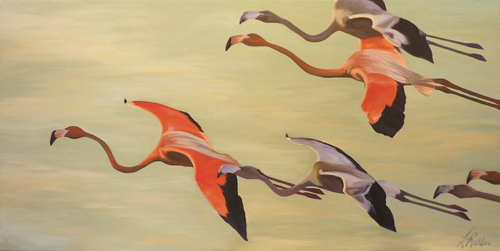 In this case, if presented horizontally the eyes of the flamingos point in interesting directions. With faces together, the eyes point outward away from each other, looking at the watchers. Faces apart and they are contemplating each other. An interesting display decision, I haven’t hung them in my gallery space yet so I don’t know what feels right to me. 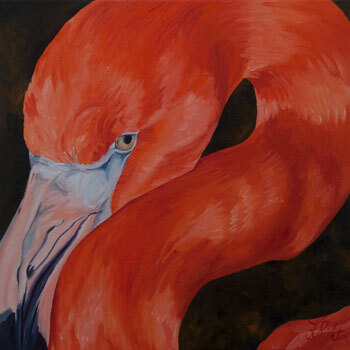 The expression of the flamingo’s body and neck is a little more coy with the soft fullness of the body behind the neck. Is this flamingo coiled in watchful repose, or waiting to spring into movement? He seems less than restful but not particularly worried about my presence. We’ve had some recent rains on Bonaire which should bring our local flamingos and egrets back to the salinas near town. Maybe some more chances for close-up photos of all the feathered ones although part of the road is closed off while construction is done on an intersection further on. The graceful curves of flamingo heads and necks seem to entwine in the shape of a heart. The fantastic coral oranges and reds add to the implied heart concept. The mottled brown and blue background allows the flamingos to pop to the foreground. 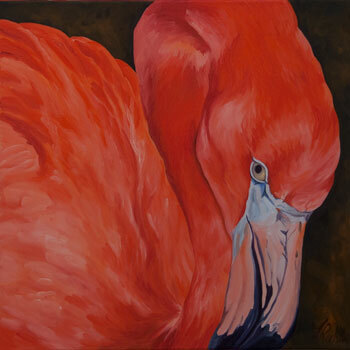 First in a series of three flamingo inspired paintings. The canvas sides are painted a solid deep coral red. Our Greater flamingos have been a daily sight these past 6 months or so here on tropical Bonaire. Yet our wet season has ended and the salinas near town have dried up. Our flamingos have flown to the ends of the island in search of wet feeding grounds during our dry season. A great blue heron and a handful of egrets are still trying to feed in the few remaining water holes. Why call this painting Flamingo World? While it could have been Flamingo Head or Flamingo Neck one of the most striking elements to this painting is the swirling water with the mix of greens, turquoise, white and beige. In many ways, it reminds me of the space photos of the Earth. It is also the world of the flamingo stalking the waters for food. So Flamingo World it is. 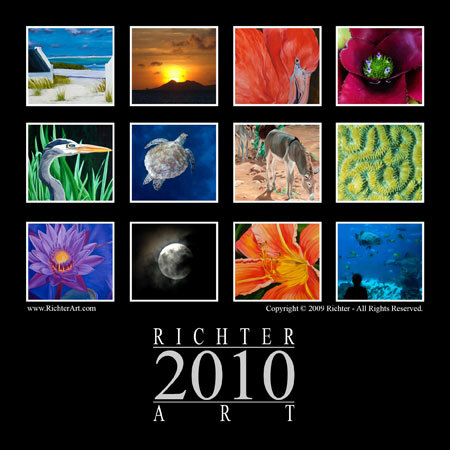 Signed limited edition prints are available in Large size 11×11″ print area $125. Reflections tell more about the surroundings. Sun, sky, plants give color to the water. 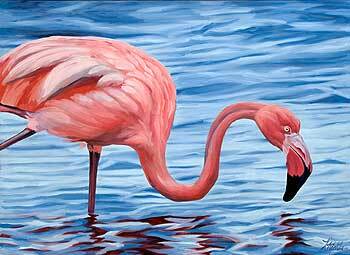 Movements of the water surface from feeding flamingos, legs in repose and possibly a gentle breeze break and flow the colors into streaks, pools and puffs.